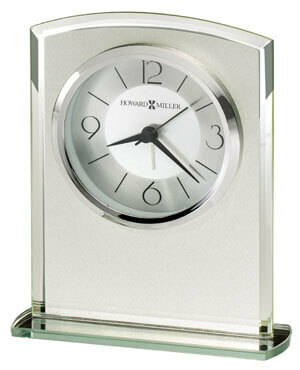 Striking, frosted glass clock with gently curved top, mirrored beveled edges, and a mirrored glass base. Two-tone dial with satin silver center and brushed silver outer ring features black Arabic numerals and hour markers; black hour and minute hands; silver second and alarm hands; and a glass crystal surrounded by a polished silver-tone bezel. Quartz, alarm movement includes one AA battery. You will save $12.90 (30 %) on this Howard Miller Glamour 645-771.